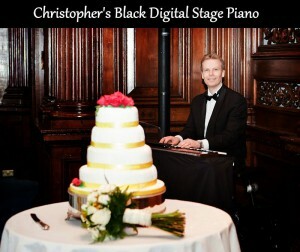 Wedding Pianist – Church & Civil Ceremonies – Birthdays & Anniversaries – Corporate Entertainment – Private Functions. Fees from £250. Welcome to Romantic Piano – the perfect musical accompaniment to wedding receptions, wedding breakfasts, church and civil wedding ceremonies, corporate events and private functions. If you’re looking to create a vibrant atmosphere for a special occasion there’s nothing better than live music. Music can “make or break” any event, so it’s important to choose a first-class musician who will deliver an exceptional performance. 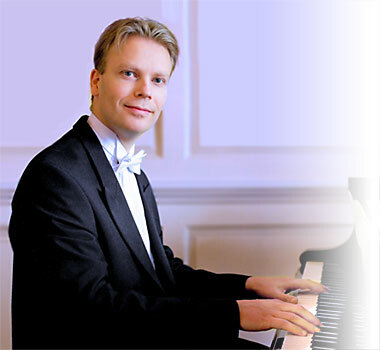 Established in 1997, Romantic Piano is presented by award-winning pianist Christopher Langdown MMus(RCM), GRSM(Hons), DipRCM(PfT), ARCM(PfP), ARCM(PG), FISM. Christopher covers the whole of the UK and, as a pianist for hire, plays jazz, classical, popular and film music – the ideal musician for live entertainment. Christopher dreamt of becoming a concert pianist ever since he was a young boy and showed outstanding early talent. Following a long string of piano competition successes as a teenager, he auditioned at the country’s leading music colleges and was fortunate to win places at them all. After careful consideration, Christopher chose to study at the internationally renowned Royal College of Music in London. During his six years at the Royal College he had the privilege of studying with some of the world’s finest musicians and was selected as one of their piano scholars of “outstanding talent”. Since graduating from the RCM with Distinction, Christopher has played at literally thousands of different events and has received wide recognition from music critics and the general public alike. Acclaimed by the Press as a “world-class” musician, he has appeared as a soloist at leading concert halls, broadcast live for radio and television internationally, provided music for celebrities and the Royal Family and was invited by the RCM to play in the Oscar-winning piano movie, Shine. Christopher is happy to travel anywhere in the UK and makes no additional charge when extra travelling times are involved. Overseas bookings are also considered. 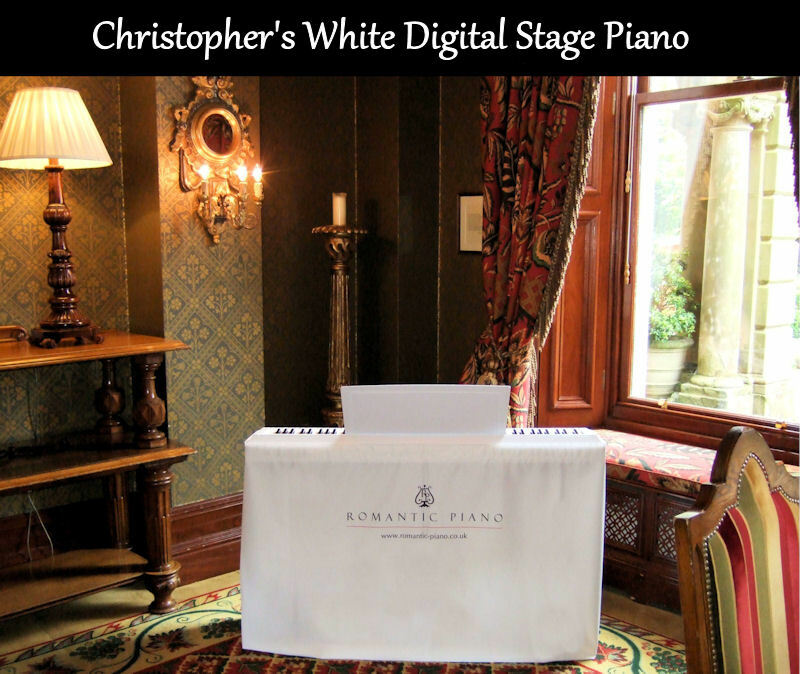 If your venue doesn’t have a piano available, Christopher can arrange a top quality Digital Stage Piano for you at no extra cost. As you’ll hear from the audio samples, this superb instrument sounds just like a grand piano. Christopher is motivated by the highest musical standards and carries out a thorough soundcheck whenever possible on the day. He can also offer clients the very useful option of connecting the digital piano to a discreet remote speaker system on the opposite side of the room. Using a remote speaker system has two clear advantages; firstly, it creates a richer and more balanced sound in the room and, secondly, it ensures all the guests (even those who are seated far from the piano) will hear the music more clearly. 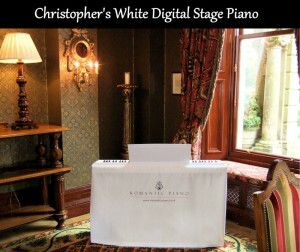 Being moveable, the digital piano can be used in any location and is suitable for any venue, large or small. If you need music in two different rooms, two separate digital pianos can be set up beforehand for a smooth musical transition. If you require music outdoors, please ensure adequate protection from the sun / wind / rain is provided. 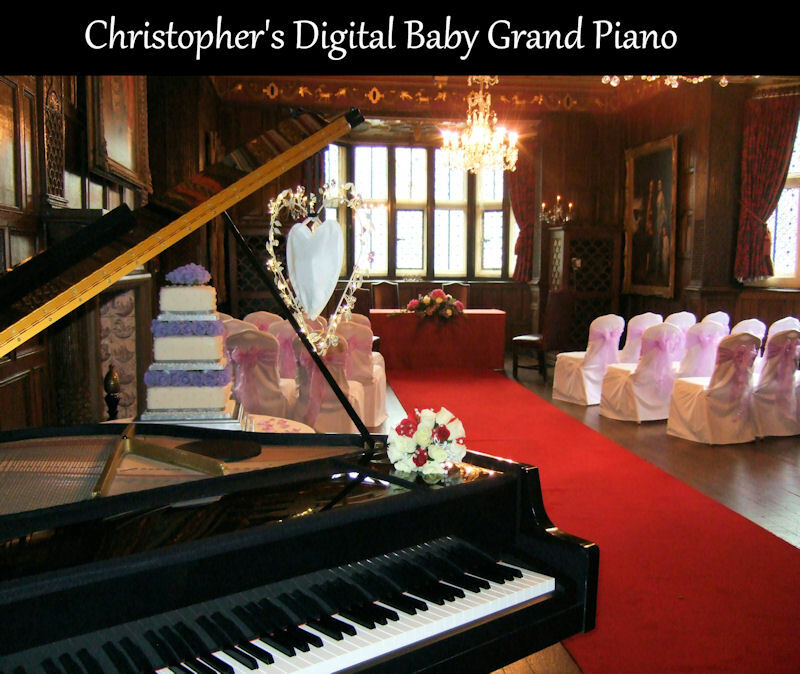 If you desire the elegant look of a grand piano for your occasion, Christopher’s portable Digital Baby Grand Piano is the perfect solution. As you’ll see from the above photo, this beautiful instrument will add a touch of class to any event. 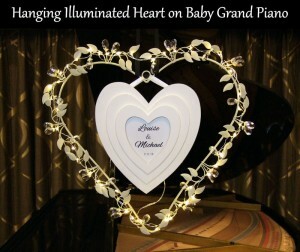 For weddings, Christopher can also offer the hire of a Hanging Illuminated Heart decoration which fits on the piano and features the names of the bride and groom. 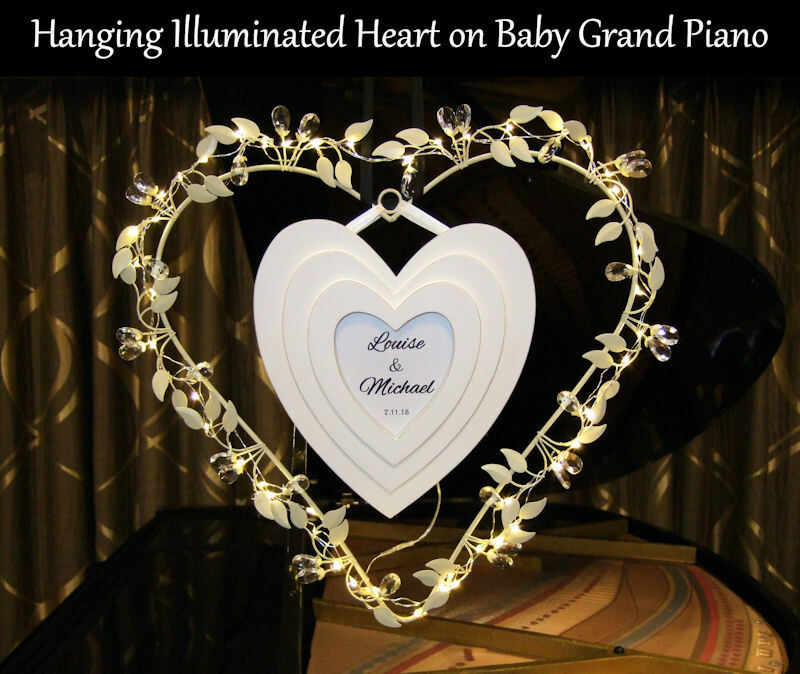 The Digital Baby Grand Piano looks and sounds just as good as an acoustic grand piano – the only difference is the cost (an acoustic grand piano usually costs around £450 to hire, whereas the Digital Baby Grand is available for £175). 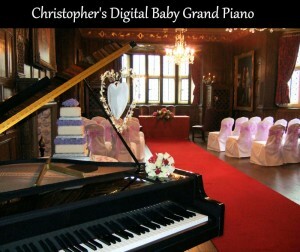 Please note that the Digital Baby Grand Piano requires 6 x 5 feet of floor space and mains power. If your event is not taking place on the ground floor of the venue, please contact Christopher to discuss accessibility. This is another option and can be arranged on request. With a wonderfully varied presentation of jazz, classical, popular and film music, Romantic Piano adds ambience and sparkle to weddings, special occasions and corporate events. Immaculately presented, Christopher performs in smart, formal attire but can dress more informally if you prefer. For more information, please visit the Weddings or Functions page. Fees start from £250. For an exact quote or to enquire about Christopher’s availability, please get in touch. To secure a booking, a basic Booking Form will need to be completed.